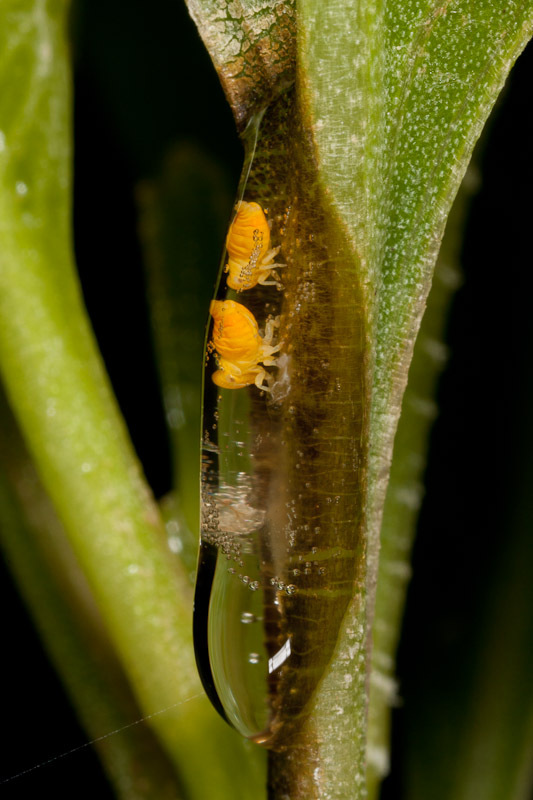 Isn’t it cool to see these normally hidden spittlebugs exposed like this? These spittlebugs surprised me by having no bubbles present to camouflage them. I have a few theories about what’s going on here, but it’s all speculation. Their orange color suggests they might be unappetizing in some way. Or maybe that sap flow itself is poisonous. Of course, they drink it, but that doesn’t mean they haven’t evolved an immunity and that the toxin isn’t broken down once ingested. Here’s another sort of wild thought I had. What if the plant has evolved a countermeasure that prevents the frothy concealing bubbles from forming in the sap? There are obviously bubbles present, just not conspicuously so. Note how they have the tip of their abdomens at the edge of the sap for breathing. Finally, did you know the frothy spittle that’s usually formed is sometimes called “cuckoo spit”?